Let me start this article with an important disclaimer, I probably follow politics closer than pretty much any other poker commentator. This doesn’t mean I know more about this specific bill than others do, but I have a really good handle on how Congress works as a whole. The reason this is important when it comes to the Reid/Kyl online poker bill’s chance to pass Congress has to do a lot more with politics than with anything contained in the bill. So with that in mind let me offer up my opinions on the chances that Reid/Kyl (officially known as the “The Internet Gambling Prohibition, Poker Consumer Protection and Strengthening UIGEA Act of 2012”) passes Congress in the Lame Duck session, or during the 2013 Congress. First we must take a look at how this bill will be passed and why it would be passed. 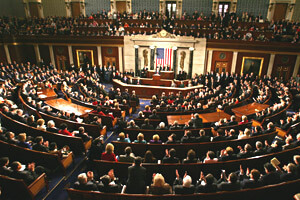 Basically Congress is facing a ticking clock with the upcoming sequestration; if they do not act than on January 1, 2012 automatic spending cuts are triggered along with the expiration of the Bush Tax Cuts. As scary as this sounds (especially when called the “Fiscal Cliff”), it’s really not that big of a deal unless Congress continues their gridlock and does nothing. Because an omnibus bill dealing with the pending “Fiscal Cliff” would need to be created quickly there is usually an opportunity to attach something like the Reid/Kyl bill to the larger legislation – think back to the UIGEA being added to the Safe Ports Act of 2006 under the auspices that terrorists use online poker rooms to launder money. So with this in mind I’m going to put the chances of Reid/Kyl bill passing Congress during the Lame Duck at about 25%. The reason I picked such a low number is that I think the chances of Congress dealing with the Fiscal Cliff in the Lame Duck session is no better than 50/50, and then there is but a 50/50 chance that the Reid/Kyl bill gets included. Now, if Congress does act during the Lame Duck, but fails to include the Reid/Kyl bill it will be difficult to get the bill passed as a standalone in 2013, unless they can somehow attach it to whatever deal is cut for the Debt Ceiling vote that will happen fairly early-on in 2013. Still, anyone who follows politics knows that few people will sign-up for such a contentious vote as gambling when it’s simply a standalone bill –the risk to reward is very low for gambling bills as the opponents of gambling are far more vocal than the proponents. On the other hand, if Congress doesn’t act before we hit January then I would estimate that Reid/Kyl has a much better chance of being included in the omnibus bill. This would give the measure the chance of being included in the overall legislation, but with the fiscal cliff already upon us, Congress would need to act very quickly and this would likely decrease any objections to gambling bills being attached, especially given the simple argument that Reid/Kyl strengthens anti-online-gambling laws for everything except poker.